Use of Tricorders is very similar to ship sensors, except that a specially designed Tricorder (Such as Medical Tricorders) Will also give the user a skill bonus in some skill because the sensors are designed for Specialized use. In Star Trek Comlinks are replaced with Personal Communicators. In TOS They take the form of palm size walkie-talkies, in TNG they are smaller Com-Badges in the shape of the symbol of the Federation worn on the uniform. Stats for both badges are basically the same as comlinks. There are ship based communications that can relay messages between combadges anywhere within the ships normal range (barring interference). Communicators by themselves are treated just like comlinks. Extravehicular transport to and from ships in Star Trek is commonly accomplished by use of matter transporters. Transportation takes only 5 seconds and works commonly up to a range of 15,OOOkm, but can be increased to as far as 40,OOOkm with additional power. There are a number of atmospheric and geologic causes for interference, which can provide either reduce the effective transport range, or block transport completely. Shields will also effectively block transport, so a ship transporting crew or cargo will have to have it's own shields down, in addition to a clear target area, before commencing a transport. It is possible to transport between ships moving at Warp speed, but it is extremely difficult, and both ships MUST be moving at the same Warp velocity. The other important thing to note about transporters is the use of a Biofilter Scan for decontamination purposes. Most known bacteriological and viral forms will automatically be rendered inert during transport. Food Replicators are only available to TNG characters. They convert a raw food stock material that the ship caries, to any of thousands of pre-programmed food types. Because it uses a base food stock as its starting component, the process remains energy efficient enough to serve as an exclusive source of food on many Star Trek TNG ships. Replicators have been shown to create food dishes and eating utensils, as well as other non-edible objects. Federation technical manuals do not discuss how this is accomplished, but it is assumed that the corresponding energy cost will be much higher. As long as unused matter, leftover food, eating utensils, and dishes are returned to the Replicator to be "reclaimed" the energy cost is still more efficient for these starships than a galley and crew of cooks. The Emergency Medical Holographic-program, or EMH as it's commonly referred to is a new Federation innov ation designed to aid the crew of a starship during times of extreme medical need as a temporary enhancement to a ship's medical team, or to temporarily replace any member of the medical team including the ship's doctor. 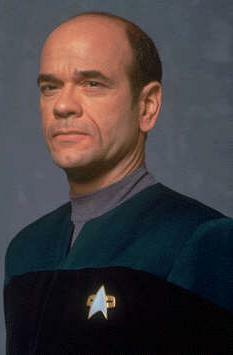 The program projects a holographic interface using holo-emitters similar to those found on a ship's holodeck. This interface was designed to allow a physical interface, allowing the EMH to perform any function an organic doctor can, including surgery. The EMH's interface is patterned after the engineer who designed it, including both the "doctor's" appearance and many of its mannerisms. Since the program was designed for temporary use it has only limited skills in "bed-side manners." The EMH functions much like a droid in several respects, having programmed skills. In addition, it also has a direct link to the ship's computers allowing it to access the latest biological and anatomical information on all known races. Since the EMH's interface is completely holographic it is effectively limited to the sickbay, however the program can be temporarily transferred to any areas of the ship equipped with holo-emitters -such as the holodecks. * All damages are variable, and maybe be set to stun. ** All damages are variable, but have no stun settings.